"This is a job for the Zula Patrol!" As soon as I put in the DVD the catchy theme song with it’s zooming graphics and jingle reminded me of the Jetsons and the Flintstones. Within the first part of the show, it was clear this DVD is on a different planet than those old cartoons. 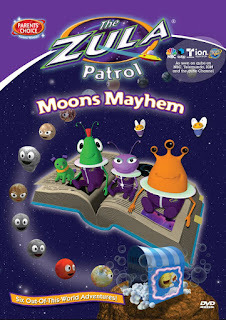 This Zula Patrol DVD is aimed at children from pre-kindergarten through second grade. I loved that the DVDs stress tolerance and non-violence. Also it is so nice to have science lessons as the main factor. I feel that is an area that we do not focus on enough. With Tristen being a constant explorer and part mad scientist, I find it is sometimes hard to find something that will stop him long enough to soak in a fact. The science lessons aren’t fact after fact after fact. There are breaks between the more lecture-like material. Information is repeated several times, so even if a new vocabulary word isn’t immediately remembered, the term comes back again and again throughout the episode. But it is not repeated three time in a row like so many shows are doing right now. This reminds me of the quality shows that I would watch on PBS. It seems to take the step between Sesame Street and Bill Nye the Science Guy. Overall, I liked this DVD. It's definitely one of the most educational DVD’s that we own. It does a good job of combining fun with fact so it's not boring. Zula Patrol was also very unique in that the characters were original, with lots of bold, bright colors, and the characters are from outer space. Very fun! You can win some of your own! I have two Zula Partol DVDs to give to one lucky winner. To enter, just click on over to www.zulaworld.com, then come back here and leave me a comment with something you learned there. Entry deadline is 8:00pm CST Wednesday, Sept. 16. Winner will be announced and contacted on Sept. 17. Good luck! I learned how to make an alien. What a great interactive game. Players collect rewards as they accomplish tasks exploring all types of science, math, and astronomy topics. Then they use their rewards to unlock new levels, decorate their spaceship, and earn badges for their Alien. You can watch the Zulo Patrol on qubo or on NBC on Saturday mornings. They have games to play! I learned that you can decorate your spaceship. I think my Teddie would definately like this site. Thank you for having this giveaway. 1. I faved you on technorati as litefoot873. 2. I faved you on technorati as litefoot873. 3. I favewd you on technorati as litefoot873. I learned that you can watch the Zulo Patrol on qubo. What can I do in ZulaWorld? You can build your own Spaceship and Alien and customize them by earning points as you play games. I learned that "Many of the games and activities are free to all members. To engage in higher level games, quests, and missions, users can upgrade to a Premium Membership for $5.99 per Month, $29.99 for six months, or $49.99 for one year." Which I think is a great price for such an entertaining site. I learned that you can build your own Spaceship and Alien and customize them by earning points as you play games.